The 2-alarm fire at an apartment building on Crossing Road is under investigation. 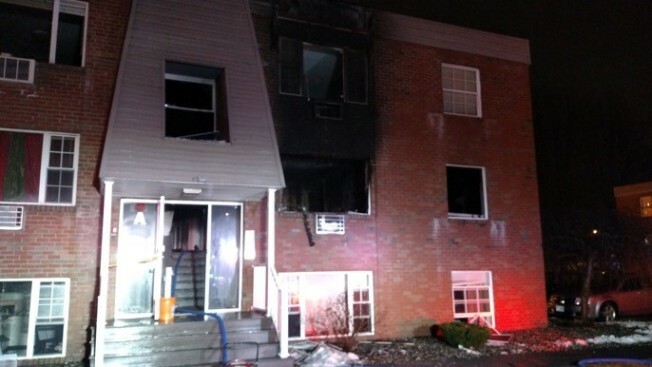 Fire officials are investigating a two-alarm fire at a Salem, New Hampshire apartment building that left one person dead Saturday night. Firefighters responded to the blaze at Building A at 99 Cluff Crossing Road around 11 p.m. Fire officials reported heavy fire coming from the second-floor window area, moving into the third floor, according to a media statement issued by the department. Fire officials reported seven people were trapped inside, and they rescued four of them using ladders. One person jumped to safety, officials said. Five people were taken to Portsmouth Medical Center for treatment. Officials said residents in 11 apartments were displaced from the fire damage. The Red Cross was assisting them. The New Hampshire State Fire Marshal's Office is investigating the fire. Manchester was assisted by several other departments in battling the blaze. Fire officials did not release the names of the injured or the person who died in the blaze.